After a few days to ponder NASCAR’s new points system, the one thing that stands out is that consistency still means much more than race wins. The 43-1 system seems to punish drivers for poor performances more than the old system. In the past the last-place driver got 34 points, compared to 195 for the winner, so the first loser got roughly 17 percent of the winner’s points. Now he’ll get one point, or 2 percent of the winner’s 47 (43 for winning, one for leading a lap and three bonus points for winning). The percentages get better on up the finishing order, which makes one wonder why NASCAR didn’t draw a line about 25th place and just have every driver below that get one point for showing up. The new points system should be fine in the regular season. Fans accustomed to fretting over their driver being 100 points out of the lead, or out of the top 10, will feel relieved that he’s far fewer points behind, forgetting that it’s just as hard to make up 14 points now as it was 61 before. (Greg Biffle finished 10th at Homestead last fall and got 134 points to race winner Carl Edwards’ 195. It really boils down to where the focus should be. Should the sport be about winning races or championships? Over the entire history of NASCAR some of the most stirring performances didn’t involve the championship. winner of the most races also won the championship. Back in 1973, David Pearson and the Wood Brothers dominated the superspeedways – and Martinsville. They won 11 times in just 18 starts, but the title that year went to one-time winner Benny Parsons. In ’76, Pearson won 10 times in 22 starts, with victories in the sport’s big three races – the Daytona 500, World 600 and Southern 500. 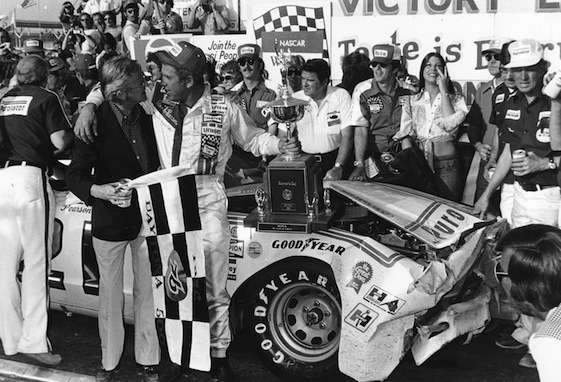 The championship that year went to Cale Yarborough, who ran all the races and had nine wins, most of them coming on short tracks. The 1985 season long will be remembered for Bill Elliott’s 11 race victories, 11 poles and his Winston Million bonus for winning three major races. But Elliott lost the title that year to Darrell Waltrip, who had three wins. A similar situation in 2003 led to the creation of the Chase format. Ryan Newman won eight races but lost the championship to Matt Kenseth, who had just one win. Even five-time champion Jimmie Johnson has won the most races in just two of his title years. And back in 2004, the first year of the Chase format, Johnson led the season in wins with eight, but lost the title to Kurt Busch, who had three race wins. Part of the attraction of point systems for racing, at least in the beginning, was to serve as an incentive to get drivers and teams to show up for every race of the season. That’s going to become apparent again this season. Watch and see how many double-dipping Sprint Cup drivers in the Nationwide Series show up for the stand-alone races in places like Nashville now that they can’t compete for the championship. It’ll likely never change, but it would be interesting to go back to the old days, when each race was a major event in itself and no one paid much attention to the points until late in the season. You were so correct, it was about the race!!!!! I mean the Wood Bros with Pearson only ran the majors, and fans pulled for him and came in droves to see Pearson, Petty and Bobby Allison battle it our, we came to see “the race! Points and point title was not the big thing it is now! 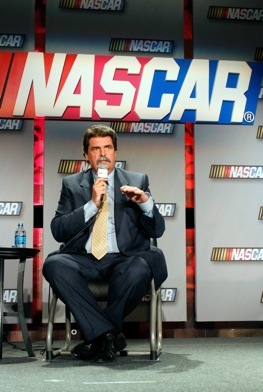 I think Nascar needs to realize “what made them” was not a playbook from the NFL! or the points system they had, its all about the race on Sunday or Saturday that fans paid to see!!!!!! Having races with “big moments” is what is needed now! Then the TV and attendence rating would take care of themself reguardless how the Chase or Point title is decided!!!!! Mediocrity wins the day…..DW also took a title from Bill using the same JUST FINISH…strategy. YAWN!!!! Think Jr. Johnson ever gave that interview? Think those word were ever thrown around the Holman- Moody pit box? Points should be secondary….BASEBALL and FOOTBALL do NOT give play-off standings point for finishing second in a game. wins should be worth more maybe a 50 pts for the winner, 42 for the second and so on would be better.